Ideal for working on smaller detailed quilts. It is ideal for strips, shapes and bias cut pieces. Perfect for circular, semi-circular and star quilt designs as well as for making bunting. Useful for home sewing projects and general measurement work they can be used with rotary cutters. Suitable for both left and right hand use. 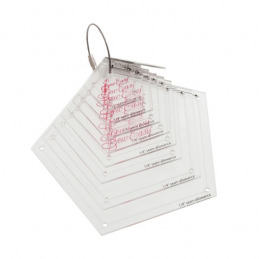 Made from tough, durable acrylic and laser cut for smoother, more accurate cutting. Improved, sharper, two-colour grid with all essential measurements clearly marked. Perfect for circular, semi-circular and star quilt designs as well as for making bunting. Useful for home sewing projects and general measurement work they can be used with rotary cutters. Suitable for both left and right hand use. Made from tough, durable acrylic and laser cut for smoother, more accurate cutting. Improved, sharper, two-colour grid with all essential measurements clearly marked. 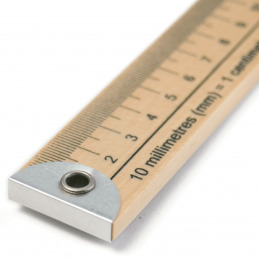 A medium sized ruler, ideal for cutting squares up to 9.5 inches, blocks, half-squares and quarter-square triangles. Useful for home sewing projects and general measurement work they can be used with rotary cutters. Suitable for both left and right hand use. Made from tough, durable acrylic and laser cut for smoother, more accurate cutting. Improved, sharper, two-colour grid with all essential measurements clearly marked. Perfect for making Dresden flat blocks. It makes marking and cutting pieces faster, easier and more accurate. The arched top means you can make either rounded or pointed petals. 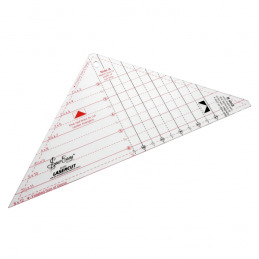 The perfect ruler for cutting outside triangles for blocks. Essential for designs where the blocks are set on-point. 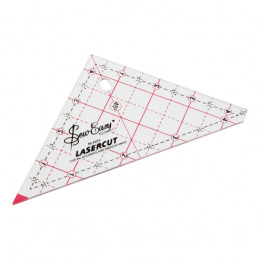 Use also to cut quarter square triangles. Easy to use and very accurate. 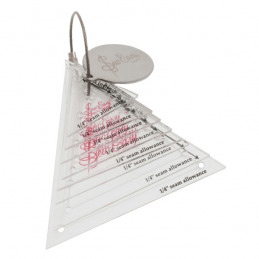 The perfect ruler for cutting equilateral triangles and diamonds. Very popular for 6 pointed star designs and tumbling blocks. Clear easy to read lines. Use for cutting half diamonds and diamonds. Extra small square for marking and rotary cutting blocks for miniature quilts and small patchwork projects. Use this small size square for marking and rotary cutting blocks for small wall hangings. Sampler quilts and other small gifts, home decor and craft projects. 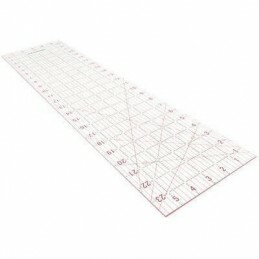 Medium size ruler for cutting squares up to 12-1/2in. Ideal for squaring up blocks. 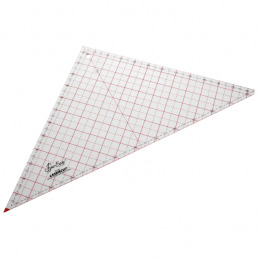 Perfect for cutting half-squares and quarter-square triangles. Suitable for both left and right hand use. Very useful for home sewing. 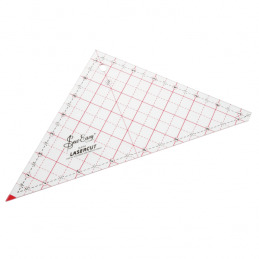 This large square ruler is invaluable for applique and piecing. Perfect for cutting large background squares and blocks. Clear and easy to read lines. A necessity for cutting half-square and quarter-square triangles. A necessary ruler for every quilter. Popular for cutting strips, squares, rectangles and triangles. 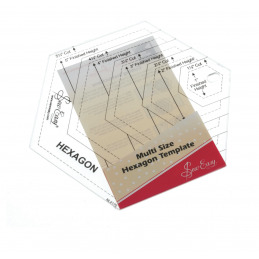 A very manageable size for cutting template free shapes. 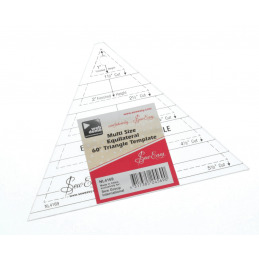 Perfect for drafting, enlarging and altering designs. This rule has 1/16in and 1/8in markings for exact measurements. The 1/2in holes are useful for marking centres, drawing circles and scallops. 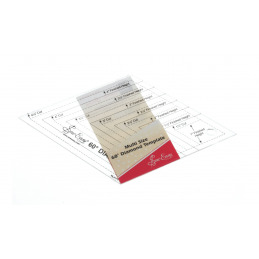 Handy acrylic ruler ideal for marking and rotary cutting.25, .5, .75 and 1 inch measurements. 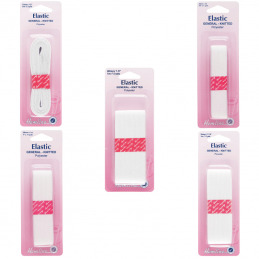 Suitable for fabric craft such as patchworking and dressmaking. Great tool where several cuts involve lengths of 3 to 12.5 inches. 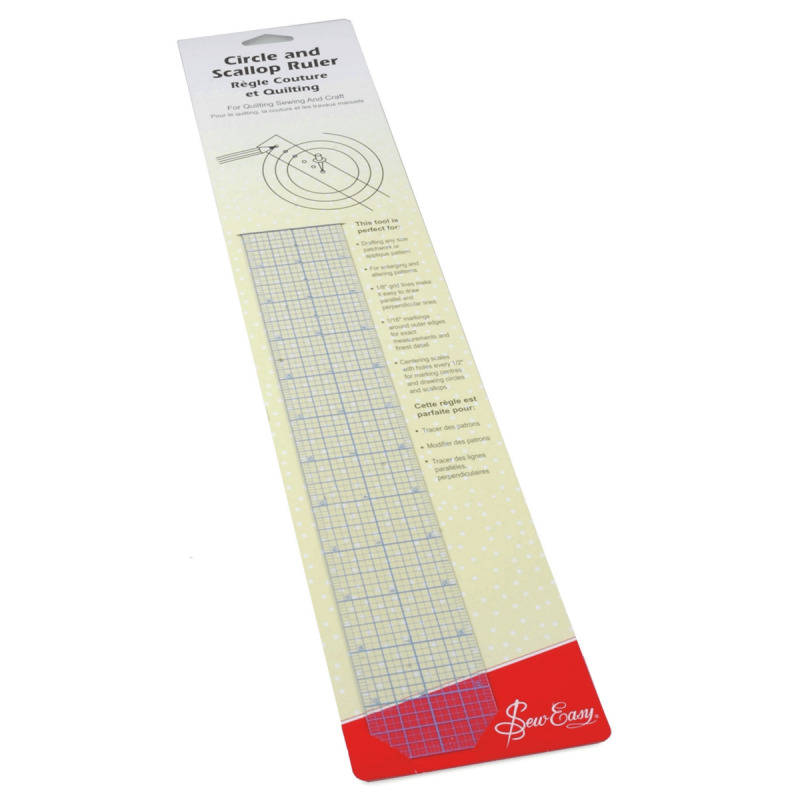 The perfect ruler for circular and semi-circular designs and quilts. A grading rule with 1/8in and 1/4in increments, together with a fine metric scale. Wide enough to use with a rotary cutter, this versatile accessory is ideal for the professional designer, home dressmaker and student. 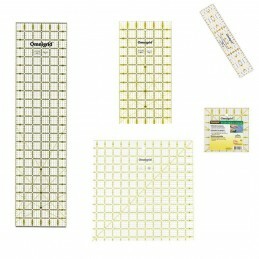 The most popular ruler in the range a must for all quilters. 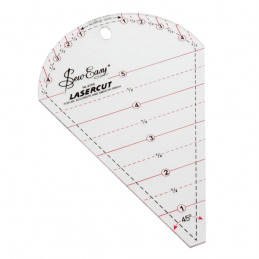 Perfect for cutting strips, squares, rectangles and triangles. Designed for right and left hand use. Great for cutting circles from 5-23cm in diameter. 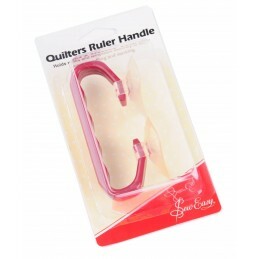 Ideal for quilting, sewing and craft projects. Instructions included. Imperial and metric. Great for knitters and sewers. Use for arm holes, hip curves, necklines and more. Incorporates straight ruler 30cm/12 inch. This transparent square features seam allowance at 6, 12 and 15mm and curves for hips and waistlines. Ideal for students, dressmaking and craft work. Make professional, accurate alterations. This ruler helps you alter patterns for personal fit, including curves for neckline, armhole, sleeve cap, hipline, waistline and hemline. Also includes a grading grid for adjusting size. 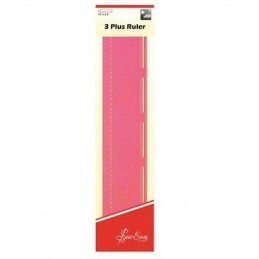 The most popular ruler in the range a must for all quilters. Perfect for cutting strips. Squares, rectangles and triangles. Designed for right and left hand use. 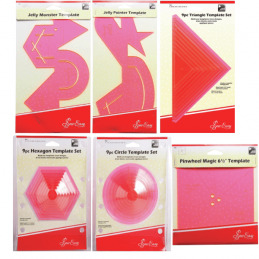 Perfect for drafting, enlarging and altering designs.